Photographer Lauge Sorenson has some beautiful photos and a short article about Cuban ballerina Viengsay Valdes here. I visited Havana in 2013 and absolutely loved it; unfortunately the ballet was on summer break at the time and so it is my dream to return and see them perform. I was staying just around the corner from the Teatro Nacional and so that beautiful building was the backdrop to my trip. I was able to do some research into Alicia Alonzo and picked up some gorgeous memorabilia from the book and poster stalls in Havana. And at home in London, I need to see Britain’s favourite Cuban, Carlos Acosta with the Royal Ballet – and his cousin Jonah who is performing with ENB! Thanks We.Do.Ballet for my nomination for the Versatile Blogger Award! Thanks for encouraging me as a new blogger and for your kind advice and comments. A shout out to her nominee Adult Beginner as well, she’s ace! 1. On The New – a London flanuese documenting her rambles around town with thoughtful photography and writing. A beautiful, visually-orientated blog. 2. Treat Petite – scrumptious blog from patissier and chocolatier Ranya. Recipes and photography of her creations – from the classics, to exquisitely decorated cakes, and alternatives for different dietary needs. 3. Conker and Indigo Makes – Camilla blogs about food here (check out her design blog too!) but her highly visual flair makes for a wonderful treat for the eyes too. 4. Vikki Vile – a dance blog! Vikki reviews all forms of dance, mainly in London. Great dance-writing. 5. This MDS Life – a personal blog written by Gerardine, she documents her life as she undergoes a radical treatment for a type of MDS, a blood disorder. A valuable resource for anyone going through a similar process, but a captivating blog in its own right. 1. I live with my little fluffy cat Bess. She likes to try catch my feet when I practice my tendus at home. 2. I’ve lived in London for about 9 years now, but I’m from Leeds. 3. I hate exercise and do none apart from ballet. I started ballet as I was trying to find a way to exercise that didn’t bore me to tears. Previous attempts included swimming, bums and tums class, and zumba. Ballet’s stuck because exercise is the least of it!! 4. Having said that I would quite like to try boxing. I loved watching Nicola Adams storm to victory for GB at London 2012. She’s from Leeds, too. 5. I used to work at an aromatherapy shop in Leeds, making oil blends, creams, lotions etc. 6. I don’t wear it every day, but I do enjoy make-up. Hilary Mantel has it bang on when she describes it as a kin of everyday folk art, I think. I’m an absolute evangelist for By Terry, by far the best foundation I’ve ever worn. I’m extremely pale and sensitive. I love lipstick. 7. My life-long pastime is reading. I couldn’t possibly decide on my favourite author or book. I’ve just finished Hermione Lee’s excellent biography of Virginia Woolf. Contemporary authors I admire include Hilary Mantel – I have tickets to see Wolf Hall in production woo! – and Donna Tartt. Don’t even ask me about other eras, that’s a different blog. 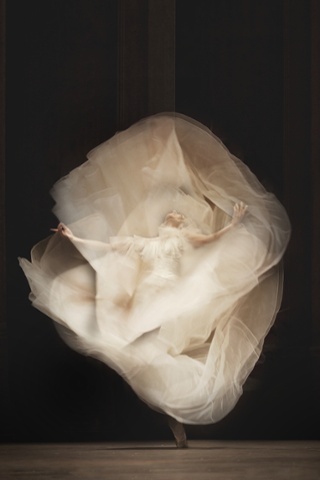 On the Guardian website today – a beautiful photo gallery of Ingrid Bugge’s new work The Essence of Ballet. You can also read Judith Mackrell’s article on Bugge and how she works, particular using digital technology. To me, the images seem to capture something about the ephemerality of performance. The delicacy of the images seems to acknowledge that they are fleeting, that the photographer has captured something magical and evanescent.